It's been a couple of years since Oppo entered the Indian market and since then, the company has managed to capture the attention of buyers with unique smartphones, right from the swivelling camera on the Oppo N1 to India's first Quad-HD display on the Oppo Find 7. 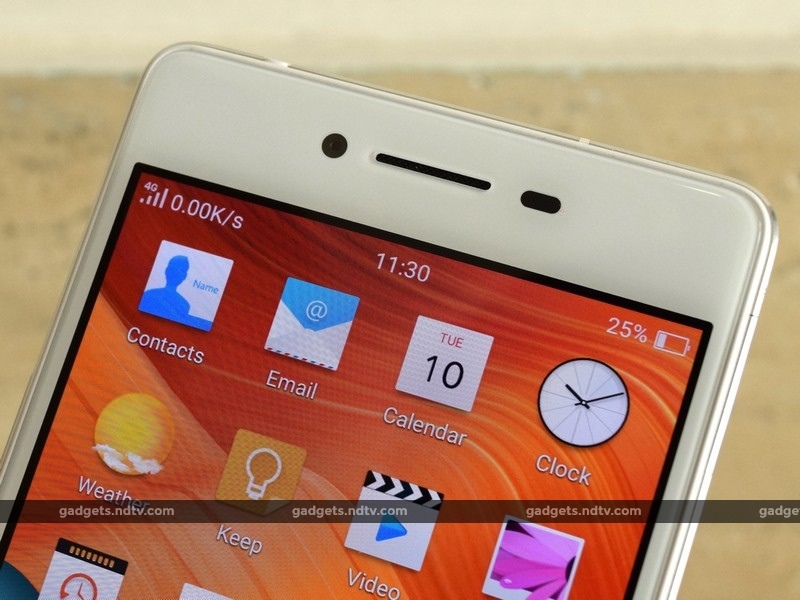 Its most recent launch is the brand new Oppo R7 Lite, a mid-range offering priced at Rs.18,000. 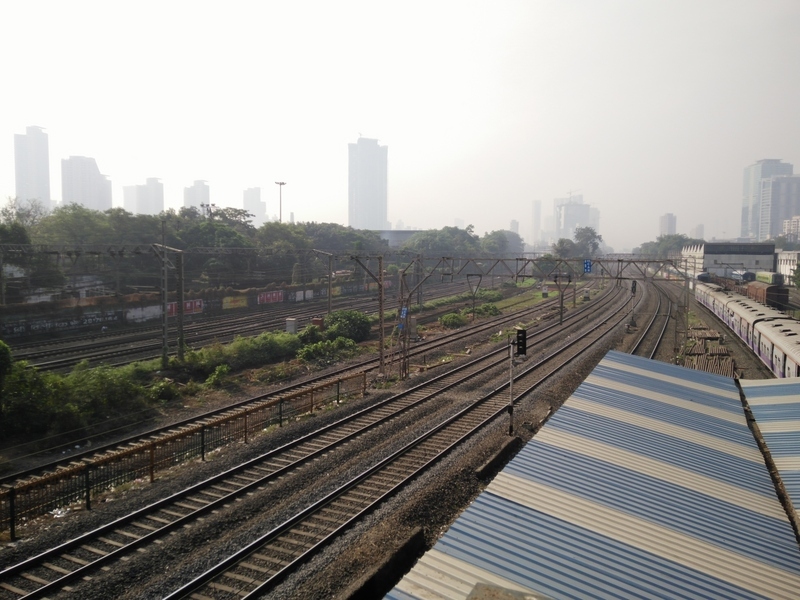 This is a tough segment to compete in, as we have the recently launched OnePlus X, the Gionee Elife S7 (Review | Pictures) from earlier in the year, and the crowd favourite Motorola Moto X Play (Review) - all hovering around the same price point. The R7 Lite is the smaller sibling of the Oppo R7 Plus and our initial impressions of both the phones were on the positive side. Let's find out if our initial thoughts hold true once we've put it through the grind. The build and finish of the R7 Lite is quite impressive thanks to quality materials used in the construction. The body is made up of a single piece of aluminium that has undergone multiple polishing processes to give it a satin finish. The buttons feel equally premium and have good tactile feedback. Oppo has managed to keep the thickness of the phone down to 6.3mm and it is fairly light too at 143g. The display gets a 2.5D arc treatment which means the edges are curved a bit for a smoother feel. In the front, we have a 5-inch HD Amoled display (720x1280) that's protected by Corning Gorilla Glass 3. The resolution is a bit low when you consider that most offerings in this price bracket now sport full-HD displays. Despite this, the pixel density is sufficiently high so you don't get any annoying jaggedness in text and icons. Colour reproduction and sunlight legibility are also quite good. The volume rocker and power buttons are placed on opposite sides. The SIM and microSD card tray sits on the right while the headphone socket and Micro-USB port take their place on the top and bottom respectively. You get a notification LED hidden in the upper left corner. The capacitive buttons at the bottom are sadly not backlit. Around the back, we have a 13-megapixel primary shooter, a single LED flash and the speaker at the bottom. To avoid sound getting muffled when the phone is placed on a flat surface, Oppo has added a tiny nub at the bottom which raises it slightly. 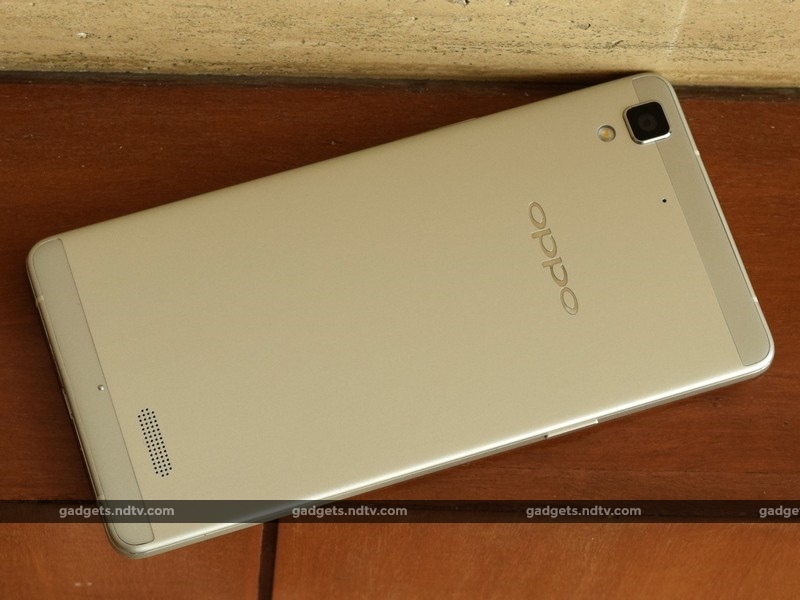 The Oppo R7 Lite is very pocketable, which makes single-handed use possible most of the time. It's incredibly slim and feels very durable despite its dainty looks. The aluminium sides can be slippery but this can be circumvented with the bundled silicon case. It's a slim cover which is barely noticeable and doesn't ruin the look of the phone. Also in the box are a charger, a data cable, a SIM ejector tool, manuals, and a headset. The phone is available in gold and silver but there's no option for a black front facia. The core specifications are very much in line with the Moto X Play. You get an octa-core Qualcomm Snapdragon 615 SoC, 2GB of RAM, 16GB of onboard storage, microSD card support of up to 128GB, and 4G LTE support. You also get Wi-Fi b/g/n, Bluetooth 4.0, USB OTG and GPS. There's no NFC or FM radio. The R7 Lite uses a hybrid Dual-SIM system so you can either have two SIM cards or one SIM and a microSD card. 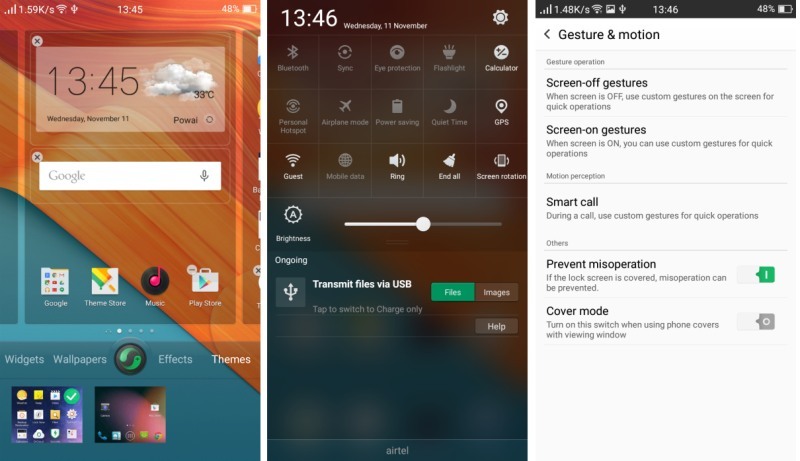 The Oppo R7 Lite runs Colour OS 2.1 which is a heavily modified skin for Android 5.1.1 Lollipop. Not much has changed, visually at least, since we first saw it running on the Oppo N1. There are ton of possible customisations, from transition effects to themes. The notifications shade also gets a new look, and in addition to the usual toggle switches, there's 'Eye protection' to reduce blue light output. The stock launcher has a single-layered design so all apps are laid out across multiple screens. Thankfully, Oppo pre-groups all Google apps so the result is not a huge mess. Other apps include Weather, File Manager, Kingsoft Office Suite, and System Update. Oppo also bundles some of its own apps. O-Cloud lets you back up your contacts and SMSes to the cloud. Security Center consolidates multiple functions such as freeing up memory, data monitoring, blocking contacts, setting privacy permissions for apps, battery saving modes and a do-not-disturb feature. The Settings app contains additional controls for gestures and motion-based shortcuts. Overall, Colour OS is one of our preferred custom Android solutions. There isn't a lot of bloatware and most of the pre-installed apps are actually useful. The Oppo R7 Lite is speedy at routine tasks. We didn't notice any stutter or slow-downs in the animations or when switching between apps. The phone easily handled heavy games such as Dead Trigger 2. Even with rigorous use, the phone would get only slightly warm, and this was with the silicon cover on. Call quality was also good and the R7 Lite easily latched on to 4G networks whenever possible. We got a score of 34,263 in AnTuTu and 8,735 in 3DMark Ice Storm. GFXbench also returned a satisfying 20fps. Overall, these are pretty decent numbers for this price segment. The phone also handles media files very well, including our high-bitrate full-HD video file. Colours are rich and vibrant thanks to the Amoled panel. The sound from the rear speaker isn't great when watching movies or listening to music but is adequate for incoming alerts. The bundled headset isn't that good either, as the sound is quite weak and the earphones aren't very comfortable to wear. The combination of the camera app and the 13-megapixel sensor makes taking photos great fun. The interface is clean and all the options are neatly hidden away under a single menu button. Focusing speed is good under favourable lighting but it slows down a bit in low light. The phone is also very quick in capturing and saving pictures with minimal shutter lag. Burst mode works well. Our one little niggle is that some of the text and sub-menus don't change orientation when shooting in landscape mode, which is a little distracting when you're trying to frame a shot and are forced to turn the phone around again. 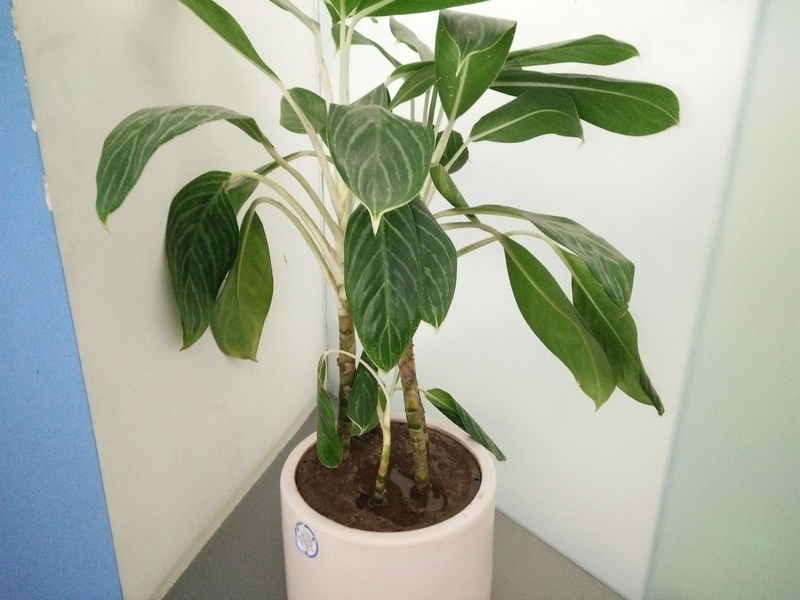 Oppo offers a useful variety of shooting modes which can be really fun to experiment with. Slow Shutter helps you with long exposure shots - you can keep the shutter open for up to 16 seconds. Ultra HD mode lets you output either a 24-megapixel or a 50-megapixel image. Images captured in this mode are smoother than those taken in standard mode, which is handy if you wish to crop portions of them later on. Edges around objects are less harsh without losing much detail which makes it good for landscapes. We recommend shooting at the 24-megapixel setting as the file size isn't too bloated and there isn't any noticeable quality difference between this and the higher resolution. There's another mode which lets you save in RAW format. Super Macro is yet another useful mode for close up of small objects. 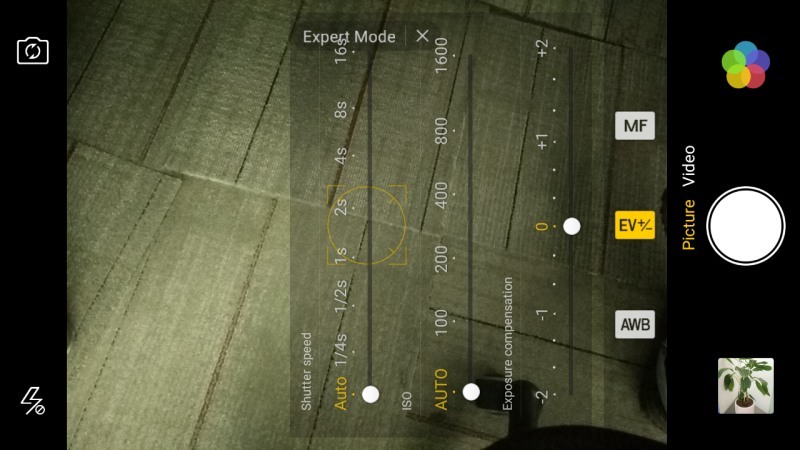 Expert Mode gives you manual controls for shutter speed, ISO, exposure compensation, focus and white balance. Unfortunately, the values of the sliders don't rotate to landscape mode so you'll have to use this in portrait. Video recording maxes out at 1080p and while the quality is good, there's isn't any form of electronic stabilisation so even minor movements makes the video very shaky. For video, you only get Time-lapse and Slow-mo. The slow motion video resolution is restricted to 480p. Landscapes shots unde natural light are good, especially with Ultra HD mode. The same goes for macro shots, as the camera manages to capture good detail and colours are fairly accurate. However, there's noticeable noise in pictures taken in low light. 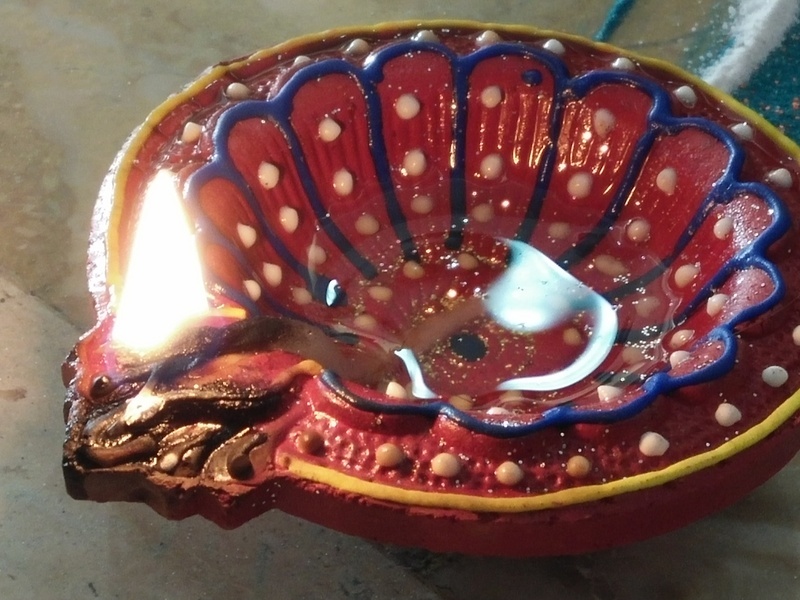 Indoor shots under artificial lighting are also not the best as there's noticeable graininess. The front-facing 8-megapixel camera supports autofocus and captures decent details. The Oppo R7 Lite manages to deliver very good battery life despite its seemingly low-capacity 2320mAh battery. We got 11 hours and 57 minutes in our video loop test, which is good. With regular use, we easily managed to go up to day and half with a bit of gaming, a few calls, and 4G usage. 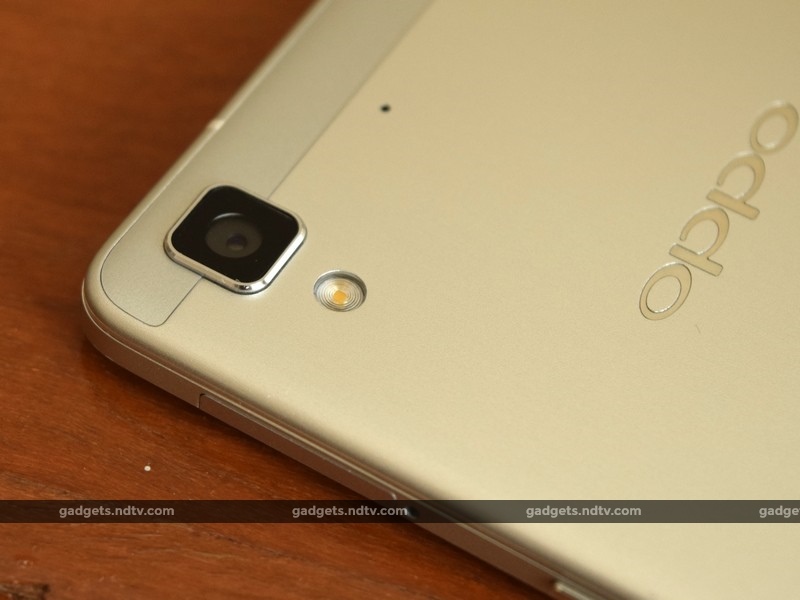 The Oppo R7 Lite turned out to be quite a firecracker in a slim package. The aluminium build and overall finish are superb, the display produces rich and vibrant colours, overall system performance is speedy, and it has good battery life as well. It also doesn't hurt that it's slim and lightweight. 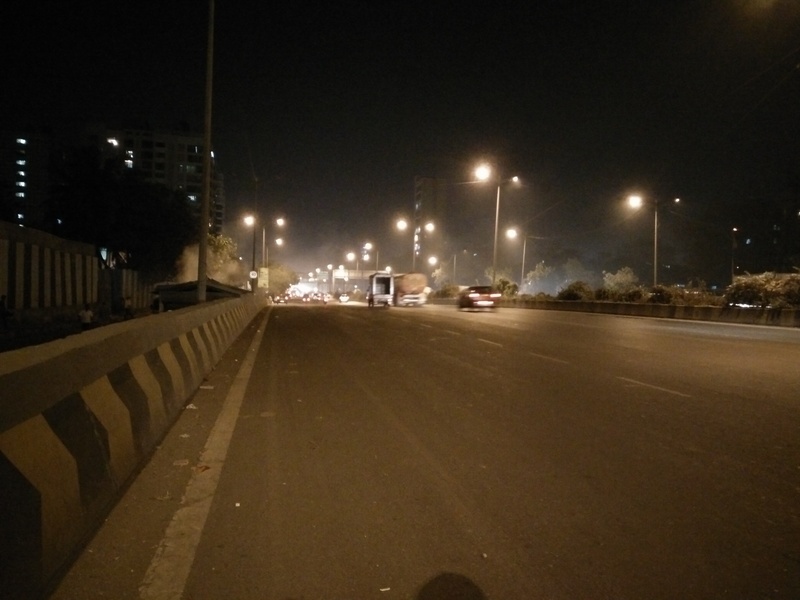 Things which could use some improvement are the camera app and low-light performance. It wouldn't have hurt to throw in NFC and FM radio. Finally, you have to remember that this is a hybrid Dual-SIM phone, which means a microSD card cannot be used if you insert the second SIM. 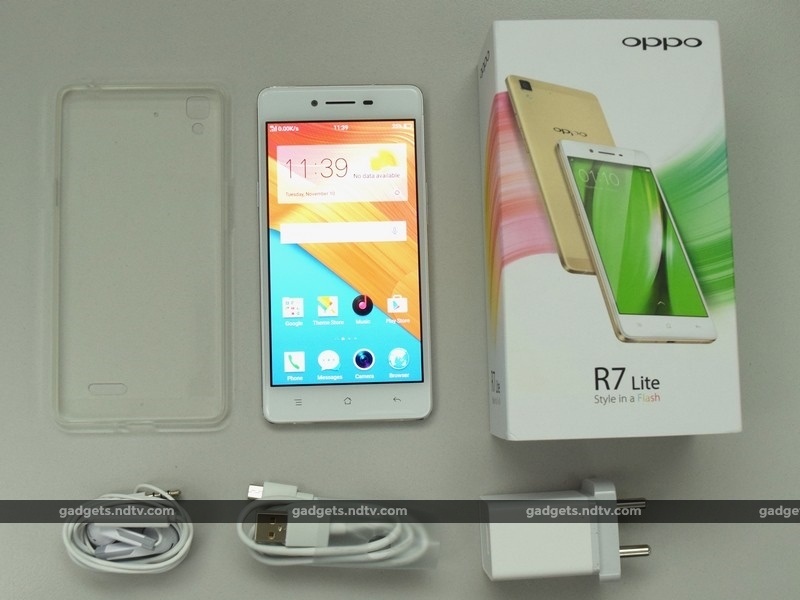 Betweenthe Oppo R7 Lite and the Gionee Elife S7, this phone comes across as a better all-rounder. Choosing between the R7 Lite and the Motorola Moto X Play is a little more tricky, because the latter promises timely software updates, a higher resolution display and slightly better all-round performance. 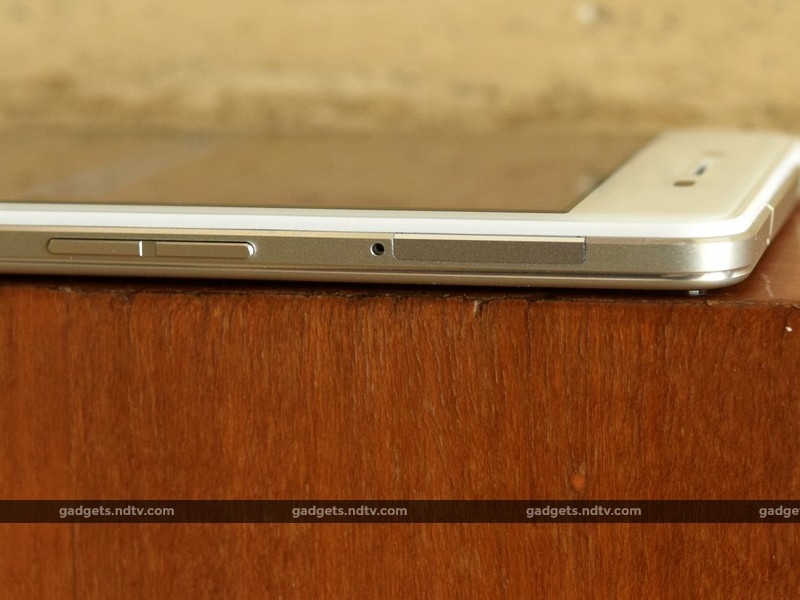 However, the Oppo has its slimmer metal body. The R7 Lite's display resolution might be inferior to that of the Moto X Play and most other phones in this price segment, but you'll barely be able to tell the difference in the real world. In this regard, the R7 Lite makes a very good alternative to the Moto X Play. product The Oppo R7 Lite is a full-metal powerhouse in beautifully slim package.